Produktinformationen "Corksport Aluminium Riemenscheiben Set"
Add a personal touch to your engine bay with the CorkSport Mazdaspeed Pulley Kit. #ZoomZoom! 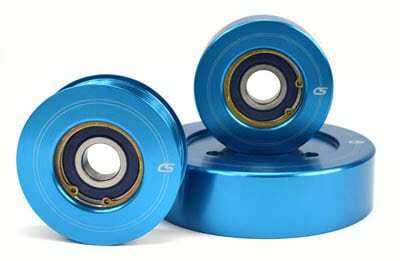 Machined from 6061-T6 aluminum and anodized CorkSport blue, these pulleys are sure to catch your eye. 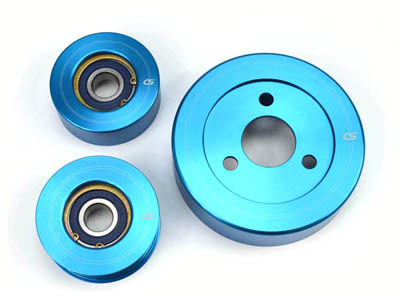 The pulleys come to you with new OEM replacement bearings pre-installed for a quick and easy installation and weighs 15% less than the OEM steel pulleys. Lightweight: The CorkSport Mazdaspeed Pulley kit weighs 15% less than the steel OEM pulleys. Precision Manufacturing: Precision CNC machined from 6061-T6 aluminum for lightweight performance. Anodized Finish in a stylish blue to keep your engine bay looking great for years to come. Looks great with the 2010-2013 Mazdaspeed 3 Radiator Panel. It will take you about 90 minutes to install the CorkSport Mazdaspeed Pulley Kit with our easy-to-use instructions. Weiterführende Links zu "Corksport Aluminium Riemenscheiben Set"
Kundenbewertungen für "Corksport Aluminium Riemenscheiben Set"